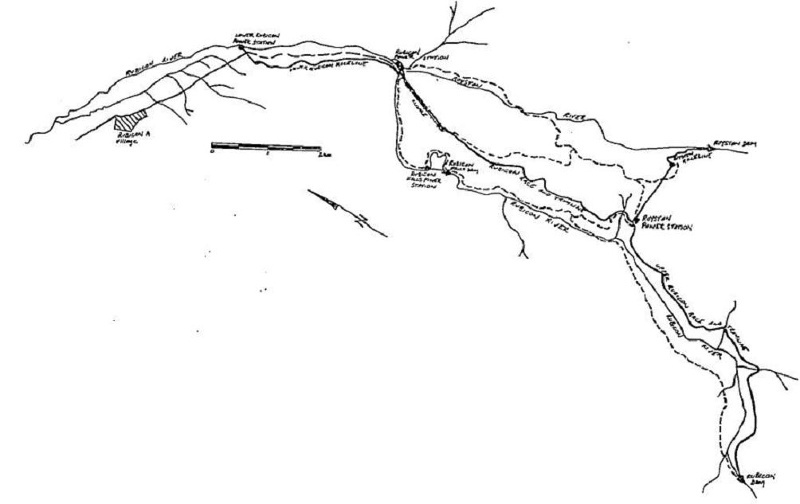 The Rubicon Hydro Electric Scheme, commissioned in 1928, harnesses the power of the Rubicon and Royston Rivers and comprises three small concrete dams, four power stations, racelines (aqueducts), pipelines (some still in wood stave construction), siphons, tramways, trestle bridges and an inclined cable haulage, all set within an extensive area of the Rubicon State Forest. The scheme has remained substantially intact for nearly seventy years and, although it now contributes only approximately 0.02% of the state's electrical energy, it still functions essentially as it did when it contributed nearly 20% in the ten years after its completion. The Rubicon Hydro-Electric Scheme is scientifically and historically important to the State of Victoria. 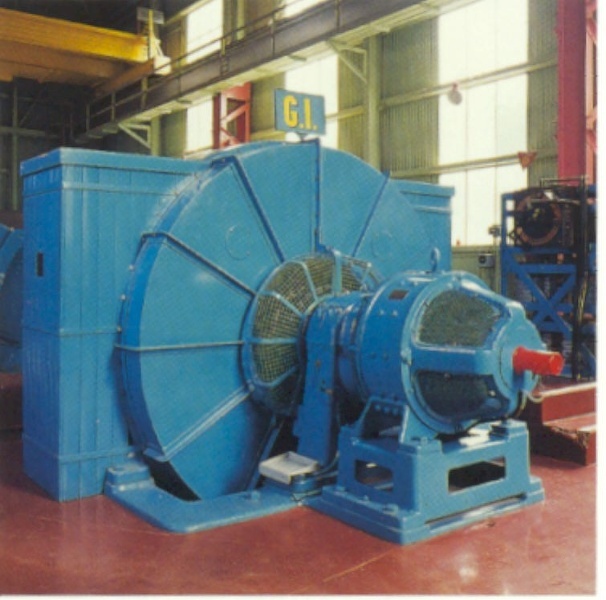 The Rubicon Hydro-Electric Scheme is of scientific (technological) and historical importance as the oldest hydro-electric scheme contributing power to the state grid. 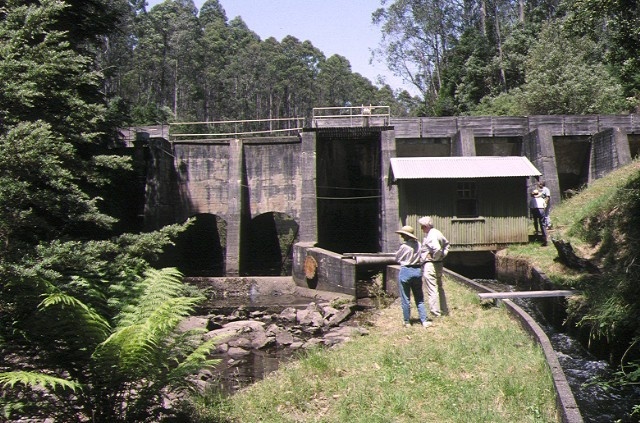 As a stream-fed system (as opposed to an underground system which uses the power of a large water storage dam) it is unique in Victoria and unusual in Australia for its multiple power stations and its repeated use of the same water. Its system of remote control operation was also very advanced for its era. The significance of the Rubicon scheme is increased by its continued use since 1928 essentially in the same form and with all its major components intact. The scheme played a vital part in providing power for the development of Victorian industrial growth in the inter-war period. Rubicon Hydro-Electric Scheme, Rubicon, Shire of Murrindindi. * all power transmission lines. 2. All of the land being a curtilage around all buildings, structures and works of 20 metres measured along the ground shown on Plan 605666 endorsed by the Chair, Historic Buildings Council and held by the Director, Historic Buildings Council. * emergency and general maintenance repairs to all structures and equipment which do not involve demolition, alteration or removal of significant fabric. substantial removal of significant fabric is required. * repairs to timber bridges which replace like with like. 1.Exempt classes of works or activities are to be planned and carried out in a manner which prevents damage to the registered place/object. However, if other previously hidden original or inaccessible details of the object or place are uncovered, any works that may affect such items shall immediately cease. The Executive Director shall be notified of the details immediately to enable Heritage Victoria representatives to isnpect and record the items, and for discussion to take place on the possible retention of the items, or the issue of a modified approval. 2. Nothing in this Declaration prevents the Executive Director from amending or rescinding all or any of the permit exempt alterations provided work has not commenced on the alteration. THE ATTENTION OF THE APPLICANT AND/OR OWNER IS DRAWN TO THE NEED TO OBTAIN ALL OTHER RELEVANT PERMITS PRIOR TO THE COMMENCEMENT OF WORKS. * Installation of new equipment required for operational purposes where no substantial removal of significant fabric is required. * All repairs and maintenance are to maintain the original appearance of elements of primary significance with retention of as much original fabric as practicable. * Repair and/or replacement of damaged elements is to be with identical materials, where practicable, which does not fundamentally change the appearance of the structure or component including repainting of previously painted surfaces in the same colour. * Works needed to comply with occupational health and safety requirements including provision of walkways, handrails, kickrails and guardrails, personnel anchor points or restraint systems, eye wash facilities, automation of valves and winches to reduce manual handling risks. * Installation of new equipment required for operational purposes including lighting, communications and control equipment such as antennae, transducers, remote control equipment and recording devices, etc in as discreet a manner as possible to minimise the impact on the visual appearance of the structure and where no substantial removal of fabric is required. * Maintenance of access tracks to all power station sites including repairs to slips, drainage works, regrading and resurfacing and extending tracks as required. * Vegetation control around all buildings and structures. * Maintenance of all major plant and equipment, including turbines, generators and electrical equipment, which does not involve significant modifications to the original plant or equipment. * Maintenance of High Voltage (HV) electrical equipment including controls and switchgear, which does not involve complete replacement of the original equipment. * Installation of replacement pumps, valves and other secondary plant items with similar equipment which does not significantly alter the internal appearance of the power station. * Installation of communications, control and protection equipment required for operational purposes in as discreet a manner as possible to maintain the overall appearance of the structure. * General building and structural repairs involving repairs or replacement with like components including repainting of previously painted surfaces in the same colour. *Maintenance and repairs to concrete structures including patching, underpinning and repairs to damaged components which do not involve significant changes to the appearance or fabric of the existing structures. * Repairs to racelines where the concrete structure has been damaged by falling trees or land instability which may include re-instatement of the concrete profile, replacement with pipes or a supported steel flume section depending on the extent and location of the damage. * Removal and relocation of the existing raceline tramway tracks where they inhibit safe access for all terrain vehicles except at visible approaches to power stations, dams or other significant structures. * Desilting of dams, diversions and hydraulic structures where no alteration to the existing fabric is involved. * Installation of walkways, handrails, lifting equipment, anchor points and security fences around susceptible structures. * Installation of motorised driving mechanisms to existing river gates and valves to reduce manual handling risks which do not require significant modification of the fabric. * Maintenance of mechanical and hydraulic equipment such as valves, scour gates, pipelines which does not require any substantial modification of significant fabric. * Modifications to forebay litter screens to improve effectiveness including installation of additional screen sections of similar appearance or replacement of damaged screens with similar components. * Installation of automated screen cleaning equipment which do not require significant modification of the fabric. * Maintenance of access tracks to all structures including repairs to slips, drainage works, regrading and resurfacing and extending tracks as required. * Vegetation control around all structures and tracks. * Repair or replacement of damaged timber components with like timbers. Installation of steel strapping or curved rods (hoops) to provide additional support to timber staves where necessary. * Vegetation control along pipeline alignment and around structures. * Repairs to localised leaks by use of sealants and temporary pipe repair products. * Maintenance of access tracks to structures including repairs to slips, drainage works, regrading and resurfacing as required. * Repairs to pipe support footings. 1. Internal lining of the wood stave section. * Works in accordance with the "Rubicon Hydro-Electric Scheme Conservation Analysis and Conservation Policy" prepared for Southern Hydro by Allom Lovell & Associates Pty Ltd, dated January 1997.